• The growing popularity of the drug is causing increasing alarm among law enforcement officials, lawmakers, and health care professionals across America. 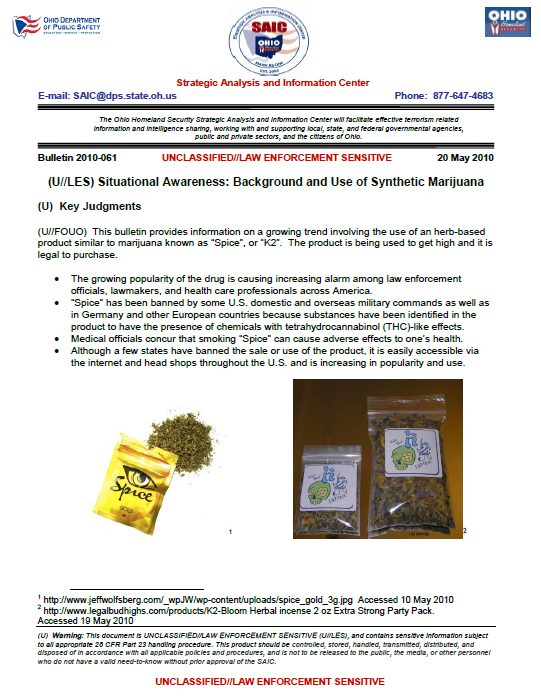 • “Spice” has been banned by some U.S. domestic and overseas military commands as well as in Germany and other European countries because substances have been identified in the product to have the presence of chemicals with tetrahydrocannabinol (THC)-like effects. • Medical officials concur that smoking “Spice” can cause adverse effects to one’s health. • Although a few states have banned the sale or use of the product, it is easily accessible via the internet and head shops throughout the U.S. and is increasing in popularity and use. (U//FOUO) A drug addiction and treatment center in Ohio reports that the danger of these products and other unregulated substances is that users perceive legal to mean safe, but they are just as dangerous to use as illegal drugs. In response to these concerns, some schools have sent out emails and letters to parents to warn them about potential dangers of smoking “Spice”. (U//FOUO) Currently, there is no legislation pending or being sought in the state of Ohio to regulate the sale or use of “Spice” although documentation has proven its increase in popularity and usage. “Spice” is not a scheduled drug in the U.S., and therefore does not fall into current federal regulations.